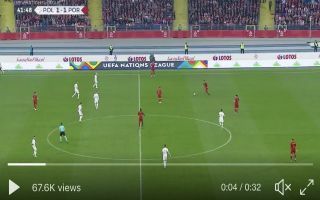 Wolves midfielder Ruben Neves produced an outrageous lobbed through ball from inside his own half to set up Portugal’s second goal against Poland. In Thursday night’s UEFA Nations League clash, the score finished 3-2 in Portugal’s favour, thanks to goals from Andre Silva, Bernardo Silva and an own goal from Kamil Glik. The own goal stemmed from a moment of magic by Neves, who fired through a long raking pass from just outside the centre circle into Rafa Silva’s path, who rounded the Poland goalkeeper before the defender diverted the ball into the back of the net. According to the Sun, Neves is on Manchester United’s radar as a possible £60 million January signing and club officials will no doubt have been impressed by his latest display at international level. Check out his sensational pass below via Twitter, which could end up being a contender for assist of the season. A clip of that glorious Portugal goal as #WWFC midfielder Ruben Neves played a truly outrageous lobbed pass into the path of Rafa, who kept his composure to round the keeper and scramble the ball over the line! How’s your touch, Rafa? ? He gets on the end of Ruben Neves’ pinpoint pass to round the ‘keeper, only for Glik to knock it into his own net! ?